I found this place through a friend’s check-in. That’s one of the best ways to find good eats. So I came here with my mom for the very first visit. GPS told me I was at my destination, but all I saw were housing & nothing more. I was confused. Perplexed, I searched on my smart phone to make sure I had the correct address because sometimes my smart phone wants to act dumb. I had the correct location, so how come I didn’t see anything?!? I decided to turn right to explore. Lo & behold, I had found the strange Waldbaum’s shopping center parking lot. You would never guess an amazing patisserie existed here, but you have to take my word for it, it does! The simple wood design with a large window makes the outside look very unassuming. We walked in & it’s a very casual place. To your left are scattered tables & a small counter with bar stools, & straight ahead on your right are a few more tables. Everyone lines up to order at the counter with their brightly colored displays of their drool-worthy confections & baked goods. They have more than desserts here. 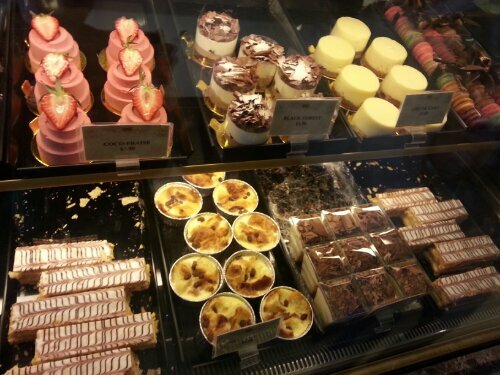 They offer breakfast pastries, sandwiches, quiches, cakes, tarts & even French macarons. Your eyes will have a field day with all the offerings, which can be quite intimidating if you don’t know what it is. I went with the counter person’s recommendations. We tried the apple strip & an almond strip. Mom & I only wanted a snack before heading to dinner. 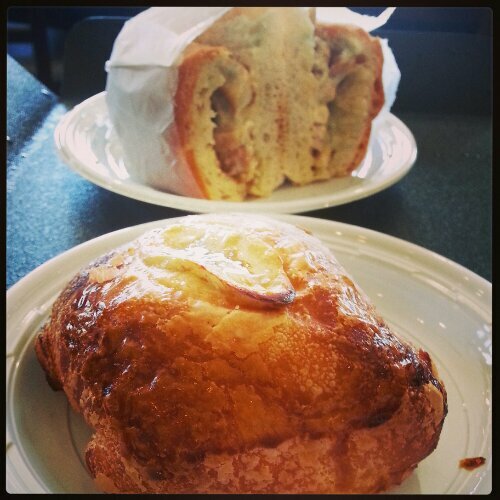 Both were flakey, not too sweet, slightly buttery, but not overwhelmingly buttery, & amazingly light & crisp. 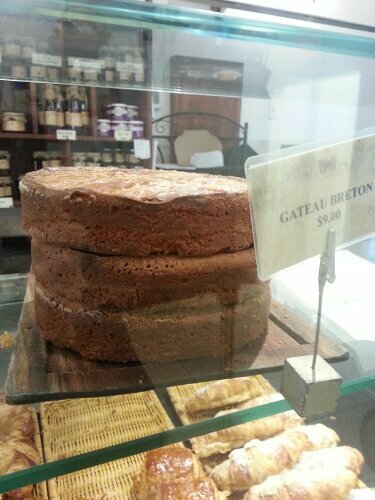 We were surprised because many times French pastries can feel so heavy. These were perfect for snacking. The guava danish looked so delicious & it was! Again, light, flakey & the filling was not too sweet as well. It was a great start. Hubby was hungry, so he went for the freshly made grilled chicken sandwich with blue cheese. Everything was made to order & they make their own breads on premise, so this was a treat for hubby. He loved the sandwich since all the flavors worked wonderfully together. Next, came the peach tart & I have to tell you, it was AH-MAZING! The tart crust had just enough crunch but melded together well with the almond filling & the natural sweetness of the peach. Each bite was better than the first. Hubby & I were fighting over the last bite. While our backs were turned, hubby’s best friend grabbed all the crumbs. It was THAT good. 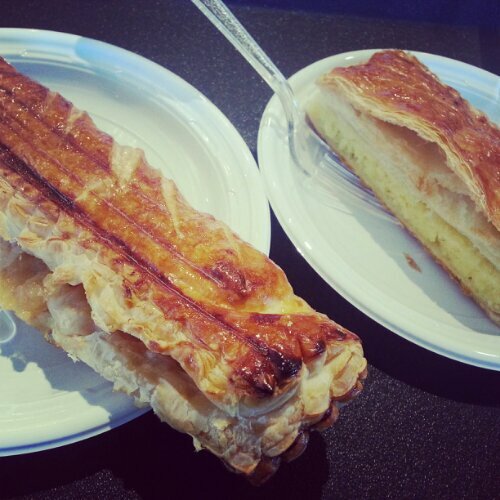 This was our absolute favorite of all the pastries. Hubby’s sister came late & asked us what was good. 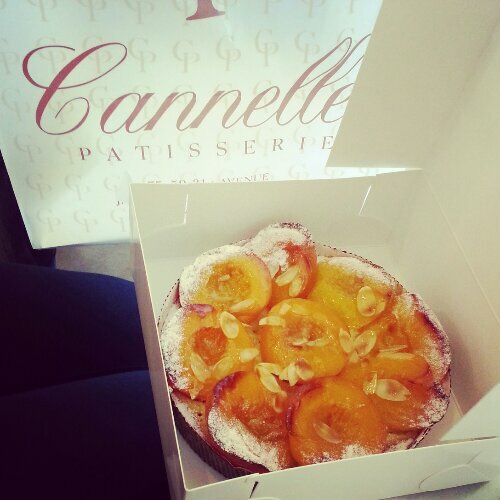 She took a bite of the peach tart, got on line & came back with the full-sized 6″ tart to take home! Everything else after couldn’t compare to the peach tart, but they were still very well-made & tasty. The Napoleon was very standard with the puff pastry layers, the cream filling & the fondant topping with the tooth picked design. It was not outstanding, but it was still good. 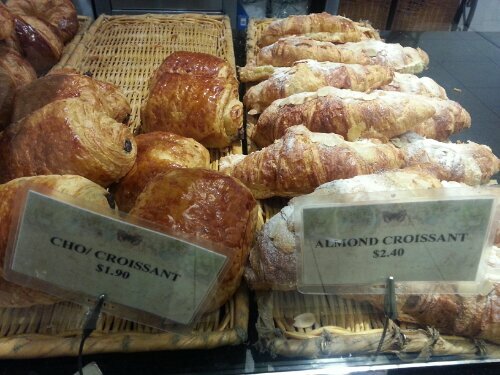 The almond croissants were devoured the next day. 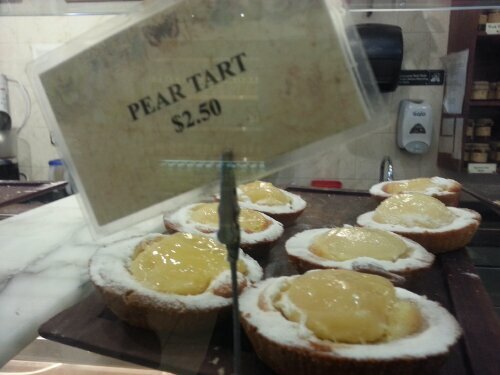 Again, as with all the other pastries, it had flakey, buttery, light dough with a filling that is not cloyingly sweet. It was the perfect breakfast. It filled you up without making you feel gross & heavy for the rest of the day. I will definitely be making another trip there to try more of their items. I heard through a friend the French macarons are pretty good & they even took their special custom order for a bridal shower, even though they don’t normally do that with the macarons. This is a great spot for great food & to hang out with a friend. Just don’t talk or laugh too loudly because the older patrons might start ranting, raving & cursing at you & challenge you to a fight outside because SHE is a black belt. Yes, you heard right, an older Filipina woman threatened us because she thought we were loud & inconsiderate. She never once asked us to keep it down; she straight up started yelling at us & caused a major scene. Her friend never once turned around to look at us because I suspect she was extremely embarrassed by her friend. True story. I hope never to have that happen again. I had to console a gf after the incident. She was whimpering & crying in the corner. Her life is forever changed by this turn of events. Semi-true story. 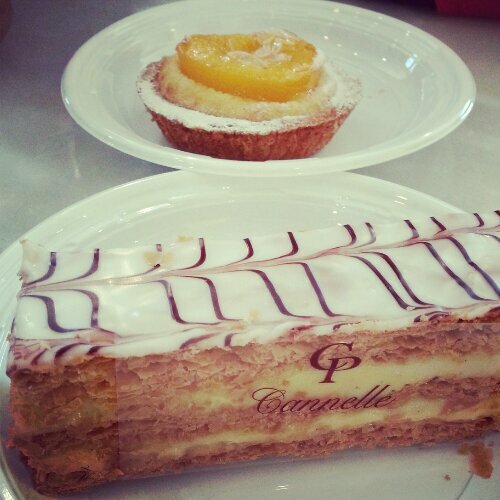 Visit Cannelle Patisserie. You won’t regret it.